A thief with drug issues is due to be sentenced after she struck three times in Alfreton and Chesterfield. Chesterfield magistrates’ court heard on Wednesday, April 5, how Rebecca Louise Bowdler, 25, of Davenport Road, New Tupton, Chesterfield, targeted Home Bargains and Wilkinson’s, on Institute Lane, Alfreton, and Lidl, on Foljambe Road, Chesterfield. Bowdler admitted stealing various items valued at £20.22 from Home Bargains, various items valued at £169.82 from Wilkinson’s and also admitted stealing three packs of sirloin steak, a pack of chicken breast and a tin of Minion sweets belonging to Lidl. 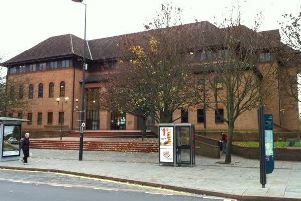 She pleaded guilty to the three thefts which happened on March 14 in Alfreton and on March 24 in Chesterfield. Defence solicitor Kirsty Sargent said Bowdler is attending Bayheath House service voluntarily to help address drug issues. Magistrates adjourned the case to consider a probation report before sentencing on Wednesday, April 12.